We strongly encourage you to first try to get TableMaster through your local game store. They're the backbone of our hobby: Game companies make games, but game stores make gamers. I cannot emphasize this enough. If they don't stock TableMaster, tell them to ask us about wholesale orders and retailer support. But if you still can't get it there, or if you don't have a local game store, this is the place to order TableMaster, the Table Packs, and other Wintertree and TableMaster paraphernalia. 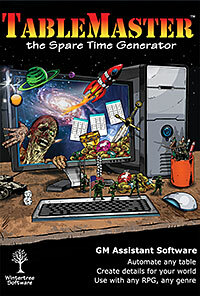 Wintertree's electronic product sales are moving to DriveThruRPG. This means if you buy something like fonts (or, eventually, TableMaster itself) you'll be able to download it instantly, instead of waiting for someone to get the notice and email the product. Various freebies, including some fonts, are also available from Wintertree there. Important note on shipping: at present, physical products can only be sent to US addresses (including APO/FPO). Hopefully this will change soon, once some details of shipping elsewhere in the world are ironed out. 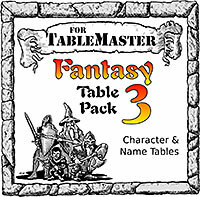 The basic TableMaster package includes a TBL reference manual (on dead trees in the physical version), complete tutorial (PDF), and 60+ tables to get you started. The physical version comes on a CD in a DVD-type case. The digital version is delivered by email. This is TableMaster with the works! 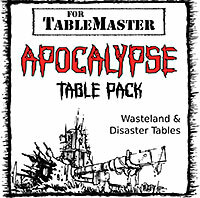 In addition to everything you get with the basic edition, the Deluxe version also includes every table from all three Fantasy Table Packs, the SF Table Pack, the Apocalypse Table Pack, and the new Zombie Table Pack (a grand total of over 250 tables). The physical version comes on a CD in a DVD-type case. The digital version is delivered by email. 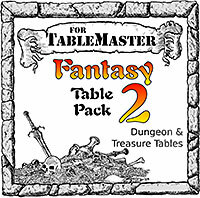 TableMaster Ultimate contains a deluxe printed tutorial and TBL reference manual, and 60+ tables to get you started. 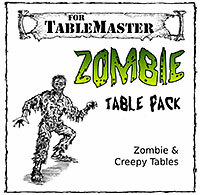 The Ultimate version also includes every table from all three Fantasy Table Packs, the SF Table Pack, the Apocalypse Table Pack, and the new Zombie Table Pack (a grand total of over 250 tables). It comes on a flash drive with a 6" x 9" printed manual which includes both the Reference and Tutorial manuals. 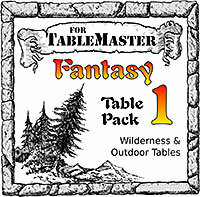 Fantasy Table Pack 1 contains inns, city encounters, pursuit obstacles, castle descriptions, and many other wilderness and urban-themed tables. The physical version comes on a CD in a jewel case. The digital version is delivered by email. Fantasy Table Pack 2 contains caverns, gems and jewelry, dungeon details, mysterious pools, tomb dungeons, and many other underground and treasure tables. The physical version comes on a CD in a jewel case. Fantasy Table Pack 3 contains names of all sorts, competitors at tournaments, character backgrounds, descriptions of people, and many other character-related and name tables. The physical version comes on a CD in a jewel case. 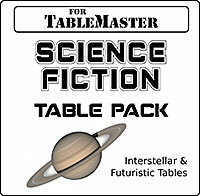 The Science Fiction Table Pack contains mysterious artifacts, star systems, rumors, newspaper headlines, patrons' requests, and other far-future and space-traveling tables. The physical version comes on a CD in a jewel case. The Apocalypse Table Pack contains descriptions of caches, bandit gangs, old artifacts, ruined towns, strange mutants, and many other tables to describe and detail a post-holocaust world. The physical version comes on a CD in a jewel case. The Zombie Table Pack contains tables to generate descriptions of people, isolated houses, vehicle failures, communities of survivors, and many more tables for zombie-themed campaigns. The physical version comes on a CD in a jewel case. This pack is not currently available, due to the "quick overhaul" turning into a months-long project to completely rebuild and expand the old AA fonts and create new ones. Many of them are now available on DriveThruRPG in various sets and packages. Once this project is complete it looks like there will be four font packs available here and at conventions: Arcane Alphabets, Gamers' Glyphs, Cryptic Ciphers & Special Symbols, and PolyDice. For people who only want one or a few of the fonts instead of the whole packages, while the big packs will be considerably cheaper per font, you can get just the ones you want at the Wintertree store on DriveThruRPG. When the power fails or the laptop battery runs out, be ready with the TableMaster Power Failure Emergency Kit! It contains a pair of 6-sided dice with engraved Wintertree and TableMaster logos, eight printed tables that are usable with dice or TableMaster, and a TableMaster flashlight pen so you can read them when the lights are out. Physical only, obviously, since it's dice. This is a nice plastic magnet with the TableMaster box cover graphics inside. We'll also include a sticker, button, bookmark, or some other swag — whatever happens to be avaiable at the time. A blue-and-white pen with the TableMaster name, featuring a flashlight in the end! Great for when your dice roll off the table and under the furniture. We'll also include a sticker, button, bookmark, or some other swag — whatever happens to be avaiable at the time. This includes a TableMaster magnet, flashlight pen, stick pen, two stickers, and possibly other things such as a button, bookmark, etc., which are available at the time.